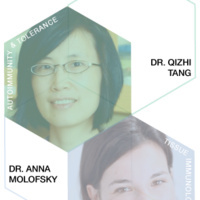 ImmunoX is proud to host the first annual Women in Immunology Symposium. The full day event will be broken into four sections covering a wide range of topics in immunology. Each section will be anchored by a 30 minute talk from a faculty member in the field as well as two 15 minute talks from UCSF trainees. All are welcome and encouraged to attend the symposium as we hope to highlight phenomenal female immunologists in the UCSF community. The Cancer Immunology session and inaugural keynote address will be given by Crystal Mackall, MD, Founding Director of the Stanford Center for Cancer Cell Therapy, Associate Director of Stanford Cancer Institute, Leader of the Cancer Immunology and Immunotherapy Program, and Director of the Parker Institute for Cancer Immunotherapy at Stanford.